There has been no "panic buying" of meat since the discovery of foot-and-mouth disease at a Surrey farm, leading supermarkets have said. All livestock movements, including the transportation of animals to abattoirs, have been prohibited since Friday. But retailers said there were no signs of people stockpiling meat in response. The foot and mouth crisis in 2001 led to a temporarily sharp fall in demand for meat but industry experts said a repeat of this was unlikely. 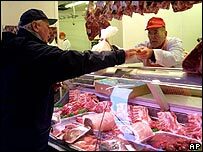 "We do not anticipate any drop in consumer demand," said Guy Attenborough, a spokesman for the Meat and Livestock Commission. But concerns remain about the availability of UK-reared meat should the ban on livestock movements remain in place for a prolonged period. "If we are not able to slaughter livestock within a week, it will become increasingly difficult to source British product," said Stuart Roberts, director of the British Meat Processors Association. Supermarkets have well-established contingency plans in place in the event of serious disruption to the supply chain. Industry groups have urged them not to rush into importing meat should a shortfall arise. But Asda, the UK's second largest grocer, said stock levels remained "good". "It wasn't panic buying as we didn't see people buying large volumes in one transaction," a company spokesman said of shopping patterns in the past few days. Tesco, the UK's largest supermarket chain, said it had not seen any stockpiling at its stores. "We don't see any particular problem," it said. "We have a robust supply chain."